Thought I would kick-off a thread, although I am off to experience some boring 'fall' LA weather for a week from tomorrow. The moisture invasion has begun and it is the kind of pattern where we should see some nice briefly severe storms fire along the ranges through most of the period - including a weekend at last !!! Indeed the latest GFS is progging some very strong instability on some days. Anyway, have fun if you can get out, and hopefully elevated heating over ranges will be sufficient for some severe pulse storms. Not so unstable today I guess but at least there are storms to the west. Some nice fresh pulse going up I guess near Katoomba as I type. the one that was anvilling well. with the rain coming in making it too difficult to take pix. 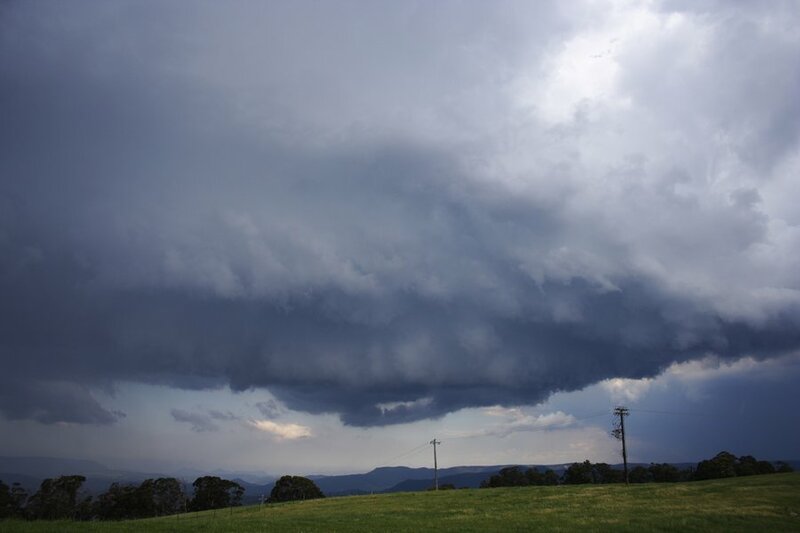 Jeff and I chased yesterday as well from the time of initiation until an intense cell exploded northwest of Penrith. Phone calls from both David Croan and Nick Moir confirmed the development along the flanking line to the north - obviously a multicell. Given the shear on the day, the storms were never going to persist. Obviously what you intercepted was the development along the 'fanning' outflow from previous storms. Not bad considering that apparently storms were not on the forecast. Yes, I was driving from Rydalmere towards Parramatta about 3 yesterday afternoon, had noticed it building up a bit and saw one CG strike. Thought we might have got something but not to be. Unluckily the thing headed north from me, and all we got was some light rain. The top of the cloud had moved a fair way in advance of the main storm so there must have been some wind shear up there. I had been working on a 10 story high rooftop in Parra up until about 1:30, this could well have been an excuse to get down early job hadn't finished already! I just got back from NZ yesterday. Was advised by my wife that Tuesdays storm wiped out our power at home for a good few hours. Im guessing a strike may have hit the big substation over the hill. Not sure if other suburbs around Galston were affected. Tracker seemed to show quite a few strikes over here. It's looking like Pulse storm heaven over the ranges for a few days! Pick the meanest looking base and place yourself near it .... or under it Sunday is my only chase day for the next few days and going by GFS, it's slowly shaping up to be a good one (if 10 knots of shear is your thing) although later in the evening looks a little better further west. Sunday is my only chase day for the next few days and going by GFS, it's slowly shaping up to be a good one (if 10 knots of shear is your thing) although later in the evening looks a little better further west. It will be my first chase day of the season, that is how poor things have been south of the Hunter, as you already mentioned it will be 'pulsemaster.com'. As per usual with these type of events there is a general propagation of storms westwards/nothwestwards as the day goes on. I don't expect much in the way of severe weather, but will be happy if I get just a nice lightning barrage. The thing I like about Sunday over Saturday is a very weak SE along the southern NSW coast overnight Sat/Sun. This may help push just a little bit extra surface moisture onto the plains east of Canberra, such as Bungundore, Tarago. I think however it may be the Victorians may walk away with the better storms this weekend. More just as a reminder, can we try remind each other to specify dates in our posts ie when you plan to chase and chase reports. Otherwise we will have confusion - just place it in bold at the beginning of your posts. My sister and I headed out as soon as I saw satpic indicate a large thunderstorm develop rapidly. Headed out but saw anvils and updrafts by the time we got to them very fuzzy. Had to take a detour near Kurrajong and almost headed back home. But we persisted out to Lithgow. Did not remain at Scenic Hill for long and ventured to the Hampton area where I saw some organisation of cumulus. One cell had developed but then exploded just as we arrived in the area. A nice base developed and sporadic hail began to fall. 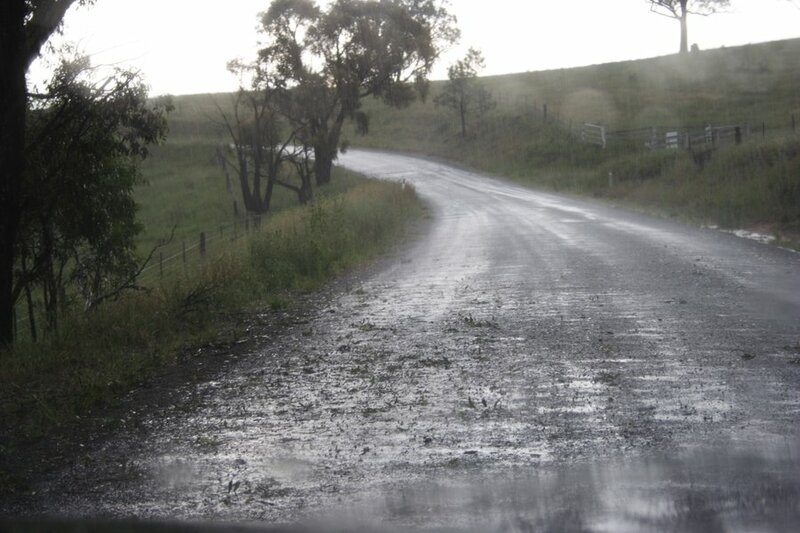 There was a torrent in the valley just 2 km distant at the most and it got rather close (verified by leaf litter later when I discovered the road into the Cox's River region later). The storm continued for over an hour to send down some impressive staccato cloud to ground bolts none caught on film - didn't bother really. The fact the storm continued and with a nice crisp anvil, I decided to head to Mt Victoria. I was naughty and running low on fuel. A few Cg's disturbed the Victoria Pass and affected our heart beats! I closed the window at this point in case one hit nearby and deafened me. They were damn loud obviously due to the surrounding topography. A towering updraft could be seen looming on overhead - quite strong in fact. Well would you know it. The lightning had put out the power - no fuel! 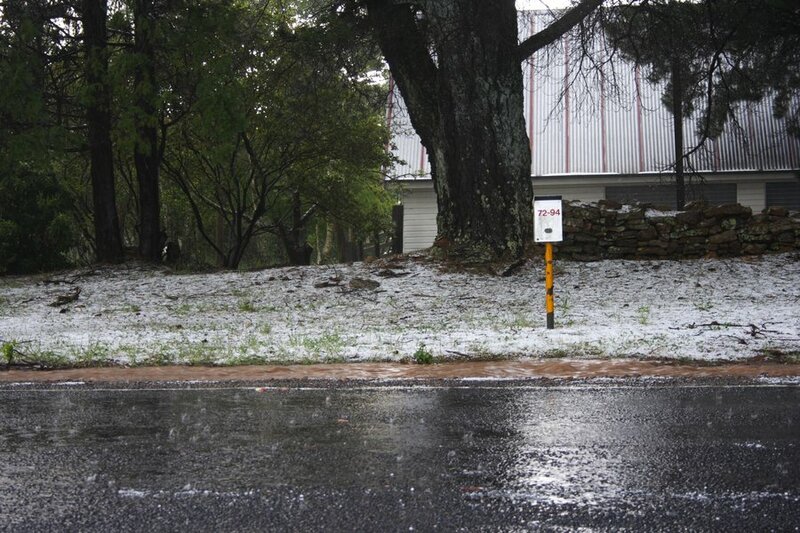 I ventured on with the fuel light on and only had to travel about 12 km just past Bell and hail! 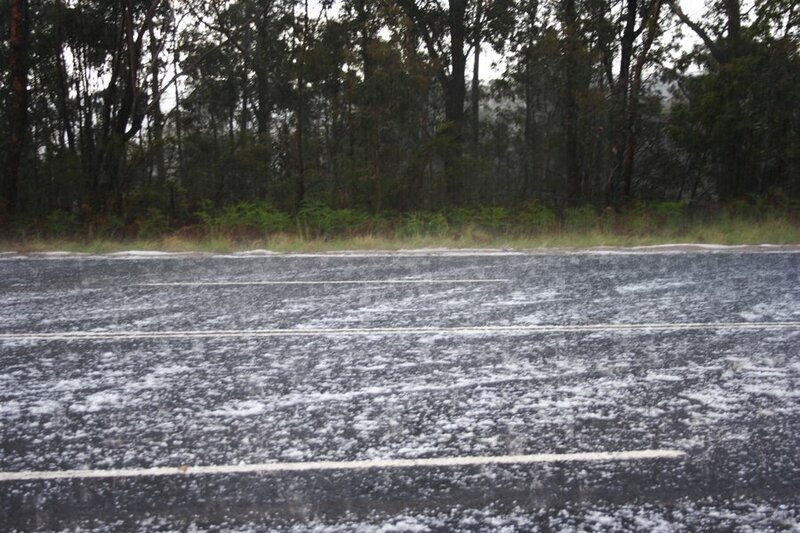 It came down in torrents and before you knew it it was virtually covering the road. Obviously the small size indicated that melt would occur. It was a nice deluge that lasted at least 7 minutes and perhaps longer most captured on video. The storm sent the odd sporadic light hail after this. 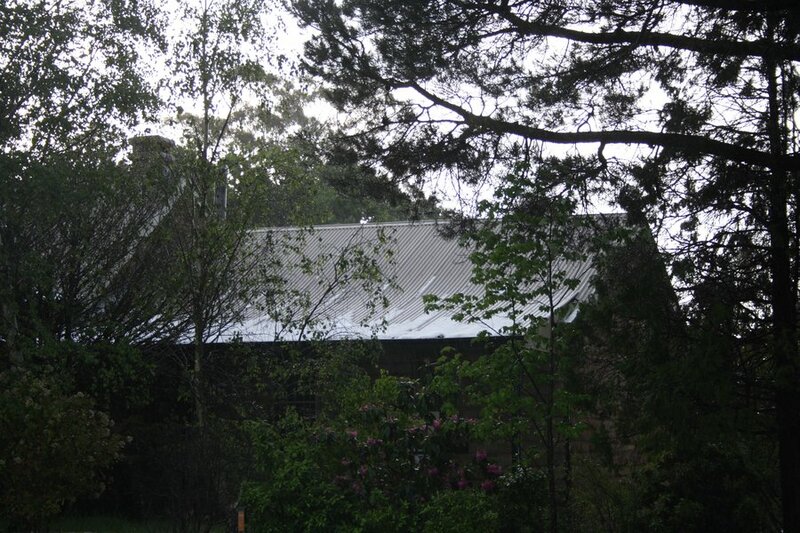 I fueled in Lithgow and with the storm weakening over the Wollemi, we headed home. Jimmy, Good pics there.. I watched this storm (16th Nov) build up outside my window at work.. I was rather suprised when this storm headed west, which then gave Bathusrt 6 mm in a very short time. Lightning caused many problems around Bathurst, Oberon, Orange with damage to power lines, trees down etc. The usual. IM at work again and looking to the South towards, Perthville way, very nice towers starting to build up.. Its an early start to what could be a busy afternoon, evening. Anyone heading out towards Bathurst, Oberon way. Looking quite nice for pulse storms again on the ranges. Today there is more moisture than yesterday with dp's in the high teens and even breaking the 20 mark in some places along the coast. Also this morning there was a thick layer of fog sitting on the escarpment west of Wollongong which is nice to see. With the steep lapse rates in place we should see some quite strong instabity. My pick would be anywhere along the convergence line on the ranges sitting roughly 50-100 km from the coast. Unfortunately, I have to do weather observations at 3pm. Its looking better and better by the minute here in Bathurst. Even Orange has a small cell started. Plenty or lighting now around Goulburn, Taralga area. Had CE staff looking at jobs down there, they advise some good storms ready to let loose. time temp dp wind dir. Penrith also down 3C between 1:00 and 2:00pm. Sydney sounding shows some steep lapse rates up to 300 so; updrafts might be quite explosive at first! If not already there, I'd be steering clear of the area where storms are already firing though as those anvils are not going anywhere fast and daytime heating is very important in these situations. I would like to see those high DPs invade the southern tablelands and then see what happens. Did not check Canberra radar till now (doh), but there appears to be a left moving ''severe storm' some 30km west of Bodalla moving north....very impressive storm at this point!! Check 3:40UTC scan in the archive. and SOUTH COAST Forecast Districts. Issued at 2:40 pm Saturday, 17 November 2007. Severe thunderstorms are likely to produce large hailstones and damaging winds in the warning area over the next several hours. Locations which may be affected include Braidwood. Edir: the storm mentioned above is rapidly weakening but, boy, very impressive radar structure for a few frames.